Over the last decade and a half, the adoption of safe passing laws has been one of the most prominent successes of bicyclist advocates at the state level. Every year since 2006 at least one state has adopted a safe passing law. At the League of American Bicyclists, we think that every state should make it clear that drivers bear the responsibility for safely passing a bicyclist. In 2017 we made a safe passing law one of our 5 Bicycle Friendly Actions featured in our Bicycle Friendly Stateprogram. As we work to create a state-by-state strategy to build a Bicycle Friendly America for Everyone, these 5 Bicycle Friendly Actions provide the building blocks for that strategy. Safe passing laws provide a basis for enforcing proper motorist behavior and ensuring that bicyclists are compensated when they are injured by overtaking motorists. They are also a sign that state lawmakers find bicyclist safety important and are willing to assign responsibility to motorists in some cases. There cannot be a traffic safety culture that values bicyclist safety without widespread adoption of safe passing laws. 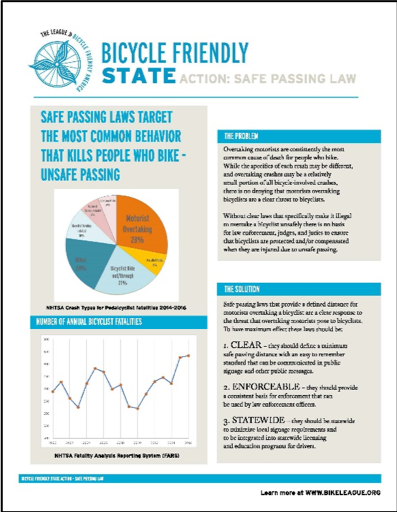 To help the 15 states that have not yet adopted a safe passing law, the League developed a short white paper to provide data, guidance and examples to encourage states to adopt safe passing laws. If you are in one of those 15 states and you plan to pursue a law in an upcoming legislative session, please let us know so that we can support your campaign with our free-to-members advocacy software and media outreach. Please use the white paper to advocate for safe passing law adoption, enforcement, and signage. If you are interested in using our advocacy software to support your efforts, please email Ken McLeod at ken@bikeleague.org.